This soup has two layers of kumquats--cooked in the soup to become mellow and tender, and finely chopped with parsley for a bright topping. Sauté pancetta in oil in a medium pot over medium-high heat until browned, 4 to 5 minutes. Discard all but 2 tbsp. fat. Add onion, carrots, celery, and thyme; cook, stirring often, until vegetables start to brown, 8 to 10 minutes. Add lentils, 6 cups broth, and the pepper to pot. Cover and bring to a boil, then reduce heat and simmer until lentils are almost tender, 25 to 30 minutes. Meanwhile, quarter kumquats and seed**. Finely chop 3/4 cup. Thinly slice remaining kumquats crosswise. Stir sliced kumquats into soup and add 1/4 tsp. salt. Simmer until lentils are tender, about 5 more minutes. Stir in 3 tbsp. parsley and a little more broth if you like. In a small bowl, combine chopped kumquats and remaining 6 tbsp. parsley and 1/4 tsp. salt; spoon onto bowls of soup. 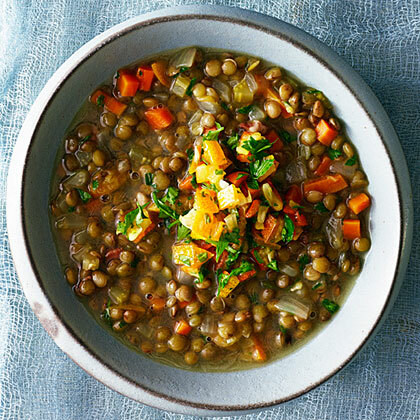 *French green lentils (also called Du Puy lentils) and black beluga lentils hold their shape after cooking. Find them at well-stocked grocery stores and purcellmountainfarms.com. **To seed kumquats, quarter the fruit lengthwise; then remove seeds with a knife tip.